In end-stage heart failure, several molecular, biochemical and functional alterations have been described to occur at the cellular level [11, 32]. Evidence indicates that disturbed excitation-contraction coupling processes may underlie disturbed myocardial function in various animal models and human conditions [3, 34]. Specifically, Ca2+ uptake and release by the sarcoplasmic reticulum (SR) have been shown to be altered, and the ratio of phospholamban/SR Ca2+ ATPase has been suggested to play a key role in the pathophysiology of heart failure . 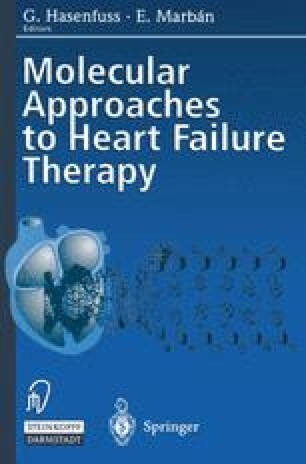 Thus, it becomes important to dissect the molecular mechanisms governing the highly regulated excitation-contraction coupling process and their alterations in heart failure in order to develop new therapeutic approaches for this disease.